Well-accessorized burgers, tasty fries and a generous lettuce wrap. All this less than two miles from campus. Welcome to Burger Up. With holidays officially here and family coming in town, it’s important to know which nearby restaurants combine great flavor with healthy, allergy-friendly offerings that can please everyone. Remember, Uncle Matt is vegetarian, and Aunt Julie is sensitive to gluten and dairy. Thankfully, Burger Up can serve both Uncle Matt and Aunt Julie something tasty to suit them. One of the main things I like about Burger Up is the variety of burgers they have. There’s the hearty Bison burger, the flavorful Troyathlon or Marathon veggie burgers or the savory Turkey burger, all of which can be ordered with an up-charged gluten-free bun. 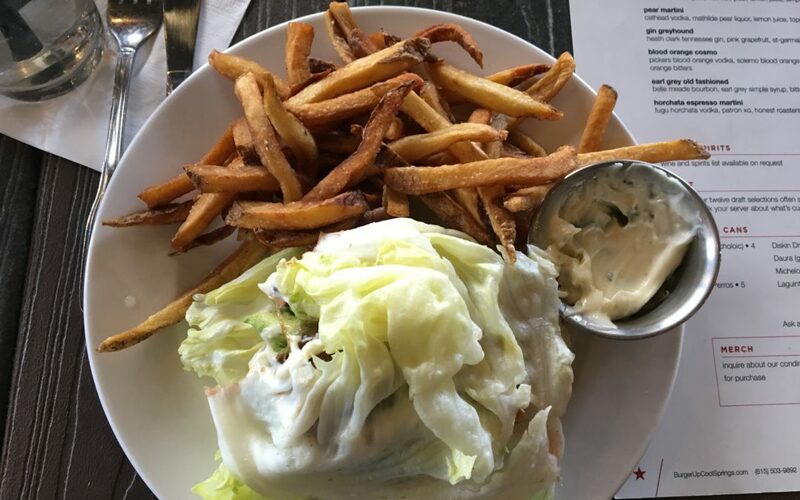 Or, if you’re on the grain-free route, Burger Up even offers a plentiful wrap of fresh, strong lettuce leaves to sandwich your burger. If you go all in on the gluten and dairy fronts, be adventurous and try the Ramsey Pimento Cheese burger, or the Byrd, which combines fried chicken, white cheddar cheese and truffle aioli. Ordering a side of truffle fries is the cherry on top. My regular order is Burger Up’s turkey burger. Since it automatically comes without cheese, I appreciate not having to worry about paying for something I can’t eat. The burger is topped with mayo and caramelized onions, which really makes the meal. The burger is decently filling, even without the bun, especially if you get a side. The pre-tax/gratuity total for the lettuce-wrapped turkey burger, which comes with fries, ends up being $11, which is quite reasonable for a nice 12 South meal. As far as sides go, I have to admit that I love a good fry. Since I don’t have severe Celiac disease, I generally feel fine after eating restaurant fries that come from a shared-fryer. It’s not the best decision, but I like to think the lettuce wrap, in place of the bun, cancels that out somehow…even if that is entirely unscientific. However, if you are more severely sensitive to gluten, opt instead for the side of steamed baby spinach for no extra charge. Spinach may not be as fun, I know, but it’s still well-seasoned, and you’ll feel better eating that. And remember, a squeeze of mayo/aioli helps the spinach go down. As far as healthy offerings go, I think Burger Up does well accommodating people, even if it’s not a uniquely vegetarian or gluten-free restaurant. You may need to spend a few extra dollars to throw in the gluten-free bun, but you’ll be rewarded with an accommodating and modestly filling, not to mention delicious, meal.